From the Jan. 14, 1988 issue of The Plainsman. You can read more about Selena Roberts’ time at Auburn here. Related: Selena Roberts, Auburn Student Journalist. * Auburn fan who ran onto the field during the 1969 Iron Bowl tells all! Where’s the sensationalism? Why’s there no mention of Chizik and drugs? Are you sure this was written by THE Selena Roberts? 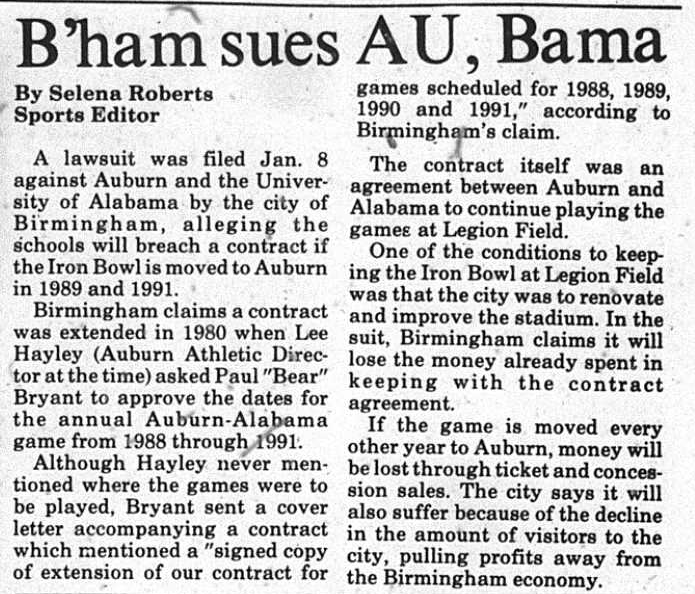 I’m sorry, but it’s time to quit calling it “The Iron Bowl.” It has nothing to do with Birmingham anymore and Pat Dye was correct to tell them what to do with it when they shoved that contract extension across his desk. It’s gotta be the “Iron Bowl.” It’s the toughest-sounding bowl. It has the best name. “Egg Bowl”? C’mon.